Create your own legend in F1 2016. Get ready to go deeper into the world of the most prestigious motorsport than ever before. 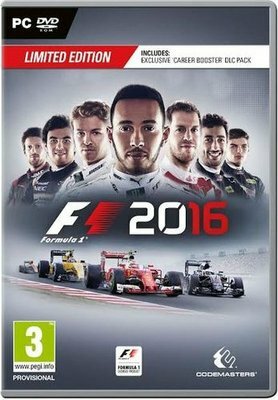 F1 2016 is the official videogame of the 2016 FIA FORMULA ONE WORLD CHAMPIONSHIP and includes the full 2016 season calendar of 21 tracks, including the brand new Baku circuit in Azerbaijan, and the full roster of 22 drivers and 11 teams, including the new Haas F1 Team. F1 2016 immerses you in not only the on-track excitement of a FORMULA ONE career, including the inclusion of the iconic Safety Car and also the Virtual Safety Car for the first time, but also uniquely offers the drama and vehicle development that goes on behind the scenes. Work with your agent, engineer and team to develop your car in the deepest ever career experience, spanning up to ten seasons. Forge your own path to glory, and rise to be the champion. Includes the full roster of 22 drivers and 11 teams, including the new Haas F1 Team. F1 2016 immerses you in not only the on-track excitement of a FORMULA ONE career, including the inclusion of the iconic Safety Car and also the Virtual Safety Car for the first time, but also uniquely offers the drama and vehicle development that goes on behind the scenes.